I was looking for a simple muffin recipe, that does not call for butter or too much sugar and came across the Quaker’s Best Oatmeal Muffins, original recipe available at Quaker Oats Website. I reduced the amount of sugar to ¼ cup and added 1 cup of frozen blueberries. 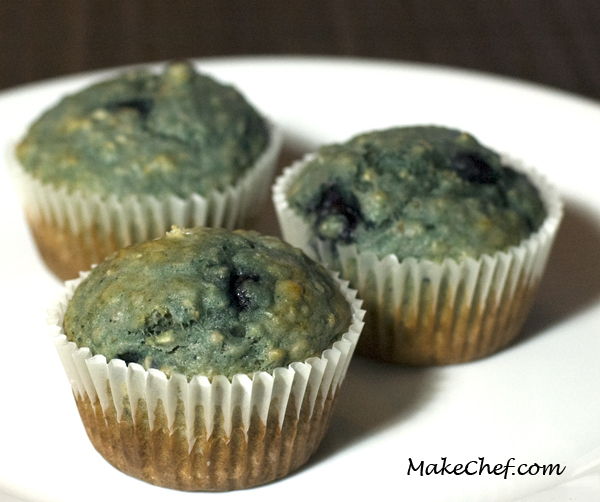 When I added the frozen blueberries to the mixture, they started to defrost which contributed to the weird color of the muffin at the end. I found the look of the muffin to be appropriate for Halloween. Heat oven to 400°F, rack middle position. 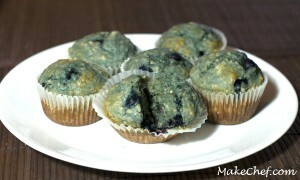 In large bowl, combine flour, oats, sugar, baking powder and blueberries. In small bowl, combine milk, oil, egg and vanilla. Add to dry ingredients. Stir just until dry ingredients are moistened. Fill muffin cups. Bake for 16-18 minutes or until golden brown. This entry was posted in Breakfast, Dessert, Flour, Oats, Recipe and tagged blueberries, halloween, muffin, oats, quaker-oats.